Home WORLD Tesla Model X vs Hummer H2 Tug Of War Battle! Tesla Model X vs Hummer H2 Tug Of War Battle! Norwegian Tesla owner and YouTuber, Bjørn Nyland, is back with another test of might for the all-electric SUV. This time pitting Tesla’s Model X against a Hummer H2 in a classic tug of war battle.If a Tesla Model X can utterly destroy a Toyota Land Cruiser on snow, the Hummer H2 is another kind of a beast altogether. At 6.600 lbs (3,000 kg), the H2 is extremely heavy. Nyland conducts a series of tug of war tests on wet tarmac and wet steel. Despite the Model X having nearly twice as much horsepower than the Hummer, and arguably a more sophisticated traction control system that regulates power to a pair of independently operated electric motors, the Tesla is no match for the GM-built American classic. However, a test of this nature has more to do with traction than just the sheer power of the vehicle. 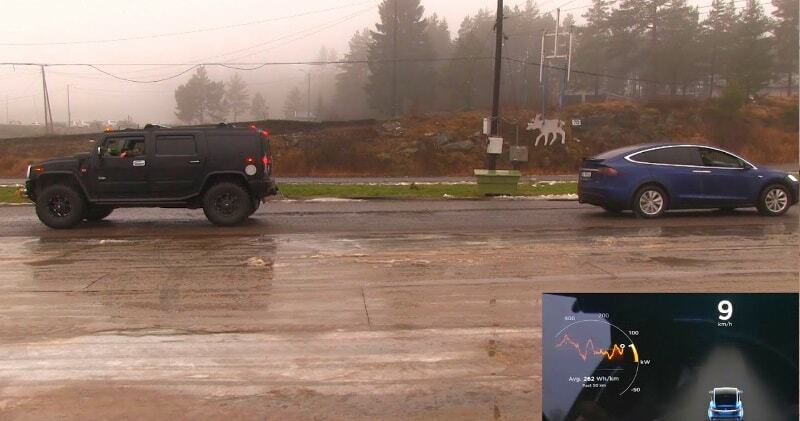 The heavier Hummer appears to have a solid grip on the slick testing ground, thus seen dragging the Model X across the surface in most of the tests. But one can see the tide turn when the Hummer with larger and knobbier tires loses its grip on the wet steel surface.